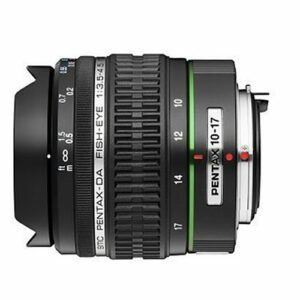 Lens Description: This lightweight, rugged Fish-eye zoom lens with 180 degree maximum angle of view is perfect for the widest panoramic scenes, as well as for the artistic lines and curves that only a Fish-eye can deliver. I bought this lens along with the Pentax K10D as my first digital SLR. My primary reason was, and is, that it is well suited to photograph rainbows, even double rainbows, and haloes and other really wide atmospheric optics effects. Round objects are rendered round (unlike a regular wide-angle lens). With a bit of practise you can use it for car interiors and other cramped places and occasionally for other purposes. Radial lines are rendered straight while tangential ones get bent a lot near the picture borders. In photoshop CS6 and newer there is a handy conversion that can de-fish images (or moderate the fisheye effect). I find sharpness OK for most purposes. Chromatic aberration is oftentimes present but can be more or less removed in Photoshop. I have used this lens quite a lot for the past 10 years and not found any quality issues.